Lignans are a type of plant compound known as polyphenols found in flaxseeds, sesame seeds, berries, and other foods. This ground breaking article breaking article by Dr. Mercola, examines some of the many health benefits of eating freshly ground flaxseed. One of the more significant benefits is in preventing and even curing breast cancer. He cites one case where a woman’s tumor shrank significantly from consuming flax seeds. One of the principal mechanisms by which it benefits is in estrogen regulation. Since many other types of cancers, including prostrate cancer is estrogen driven, both women and men can benefit from flax seeds. 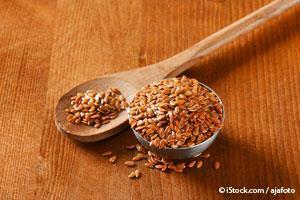 Another benefit of flax seeds is estrogen regulation. They not only reduce excess estrogen, but can increase low estrogen levels as well. This is an important benefit to aging women. Since older men suffer from excess estrogen levels due to conversion from testosterone, I believe flax seeds would provide similar benefits for older men. My article The Cancer Fraud has begun to elicit criticism from defenders of conventional medicine. It is difficult to change paradigms, especially when so much is at stake. My heart goes out to cancer sufferers and their families. However difficult it is to consider new ideas, we must face them if we are to avoid the inevitable suffering that cancer produces. Conventional medicine is an abysmal failure in treating cancer. It is time to face that fact. A defender of conventional medicine has raised some good points that I would like to address. Following are his points and my response to each one. Your definition of conventional medicine is treatments that have proven effective, while alternative medicine is comprised of treatments that are not proven in their effectiveness. When they are, they become conventional medicine. Recently I went to the viewing of a friend and neighbor whose life was taken by cancer. Or rather that is what we are told to say and believe. What I mean is that I question whether cancer is the almost certain mark of death we are lead to believe or rather the result of widespread ignorance, quackery and even, dare I say – fraud.